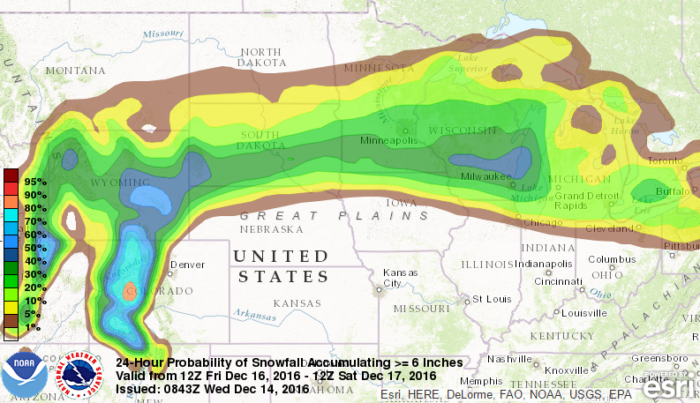 A one-two punch is headed for parts of the Upper Midwest late this week and into the weekend. Temperatures for parts of the Dakotas, Iowa, Minnesota and Wisconsin are already very cold, but they are expected to be even colder this weekend as more Arctic air pushes south. But before the bitterly cold temperatures arrive, a big storm system will drop heavy snow across much of the region. An area of low pressure is expected to exit the Northern Rockies and push through the Central Plains into the Ohio Valley between Friday and Saturday. This feature will drop heavy snow for parts of the Upper Midwest with the potential for double digit snow totals somewhere in central/southern Minnesota and Wisconsin! It’s still too early to talk specifics, but this storm system does look to bring significant snow and hence, travel headaches, from Friday afternoon to Saturday morning. Behind the snow, another blast of Arctic air will invade the region. This does look to be the coldest air of the season so far with actual air temperatures dropping well below zero. Wind chills will be dangerously low as well with some spots feeling as cold as -35F to -40F below. Wear lots of warm layers and take it easy on the roads this weekend! 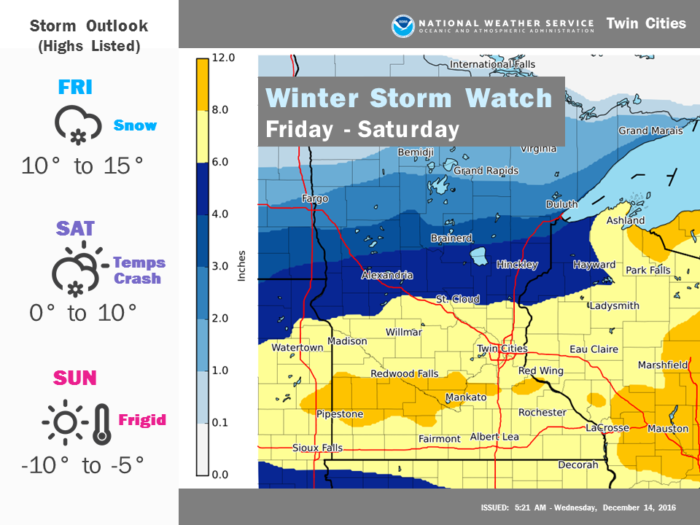 For the latest information on the upcoming winter weather, check with your NWS office or local media.